Roof Gutters are the metal or wooden channels that are located around the outside edges of your roof, whose purpose is to keep rainwater from being allowed to accumulate around your Foundation. The purpose of roof gutters is to prevent rain water from draining or accumulating near the foundation of the house or building. Soaking the soil near the foundation can cause foundation walls to settle, basement walls to bulge, and water pressure can even begin to leak water through the basement walls. Your home's Roof Gutters also include 'downspouts' which channel the water down to the ground from the roof line, and include 'splash pans' which are located at the bottom of the downspouts to direct the water away from your home. 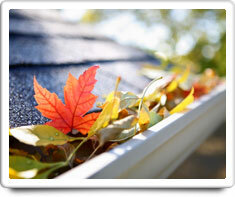 Shown in the 'Routine Care' section are the recommended routine maintenance tasks for your roof gutters. The 'Q & A' section shows answers to common questions. And the 'Articles' section provides helpful articles about your roof gutters.